It’s time to revamp harassment trainings, to not only better deal with harassment in the workplace but to eliminate it altogether. The #metoo movement is continuing to make waves in society, and it is an employer’s job to be proactive rather than reactive. In the past, harassment training has been offered merely to check off a box for the human resources department. Now more than ever it must be a legitimate knowledge-sharing session that teaches employees how to spot harassment, what defines harassment, and what you can do both as a victim and as a bystander. 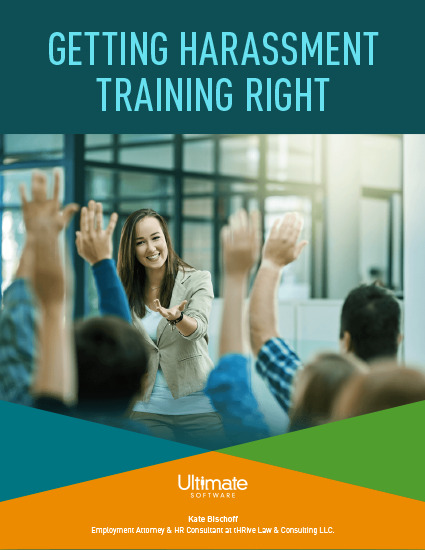 In this guide, Kate Bischoff, employment attorney and HR consultant at tHRive Law & Consulting LLC, outlines new strategies to make your harassment training more than just a checkbox. Kate Bischoff breaks down how to effectively pick a trainer and considerations to refer to when creating a curriculum. Her strategies aim to better teach handling harassment in the workplace with goals to eradicate it altogether. Please fill out this brief form to access your compliance guide.